Manitoba Games' stoner operations simulator Weed Firm was rolling high on the App Store's joint, topping the charts before the marketplace's custodians decided to bluntly weed it out, extinguishing access to it and leaving hundreds of thousand of users feeling rather spliffy. It was rather questionable how the controversial game ended up in the App Store in the first place, seeing that Apple's app market is famous for a stringent approval process and dismissal of questionable content. Then again, there has to be at least one Apple employee in there that habitually uses green medicine for recreation, and he or she probably thought the game was worth passing along. Manitoba asserted that “the problem was that the game was just too good and got to number one in All Categories, since there are certainly a great number of weed based apps still available, as well as games promoting other so-called 'illegal activities' such as shooting people, crashing cars and throwing birds at buildings." Admittedly, the developers have a good point there, although we're yet to hear of incidents involving catapulting birds towards unstable buildings - which means Angry Birds does a pretty poor job with "promoting" said activity. 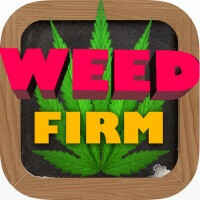 Unfortunately, Weed Firm also got the axe from Google Play, but for a whole different reason - Google has some beef with the game's original publisher. But if you are already missing the game on either Android or iOS, grieve not. Like Flappy Bird, which died a honorable death but is about to rise from the ashes like a Flappy Phoenix, Manitoba is promising Weed Firm will triumphantly return. "The Apple version might need to be censored a bit to comply with Apple's strictest requirement since they are going to be looking very attentively at what we submit from now on. Google never had a problem with the application itself. The problem was with our publisher and we are expecting to return to the Play Store once we find a suitable publisher." - said the developers. Not only that, but Weed Firm 2 will be showing up later this year, with "updated and improved graphics and gameplay, new locations, magic mushrooms, new characters, and much, much more!" Sounds like the beginning of a blazing franchise! Sounds like a fun game. Apple is the no-fun police. A game that promotes drug use getting removed when it got to the top. So what's the problem? Then what about the ones that promote: - crazy driving (any car driving game) - killing people (any first person shooter, fantasy games, etc) Would you also want them removed? Those are stylized. Would you want your child downloading a game about illegal substances? Same there, would you like your kid downloading a game about killing people? And weed is not ilegal everywhere, killing people is. Don't you find it any hypocrital to complain about one but not the other? Yet they have all the Grand Theft Auto's in the App Store and hundreds of games where people kill each other, but Apple is worried about a little green? I know of states where growing it is legal, but can't think of any states where killing is legal though. Can't you still download "Drug Wars" in the apps store? Does that not promote drug use too? That's such a bs comparison. Those games have age disclaimers. Those games are fiction. This is a game promoting pot smoking. Your an idiot. A game about weed is much better than a game about killing people. Like said above weeds/other drugs are not illegal everywhere. Killing is. Because its apple so what ever the right things they do automatically is wrong. Massive misinformation on the cancer bit, guy. My grandmother has spinal cancer and any medical marijuana she takes is only for nausea and giving her more of an appetite. Marijuana does not cure cancer. I think he meant to treat and cure the effects and symptoms of cancer and chemo. I can vouch for the fact that a member of my family suffers from Crohn's Disease and ganja is the only remedy that has reduced the inflammation and kept this person off the surgeon's table. Dr. Sanjay Gupta has admitted he was wrong about Cannabis. Dr. Gupta's reputation is beyond reproach and I'll believe him over some stuffed shirt at Apple. Get over it people, grass is not the evil weed as it's portrayed in the media. It is, however, a cash cow for the private prison industry in the US. Follow the money if you want the truth. Any way to sideload on Android?